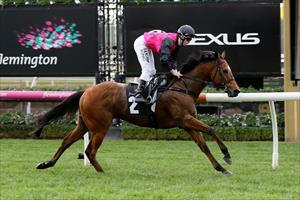 Barthelona and Potemkin combined to give the stable two winners over the weekend. Barthelona (pictured) made it back-to-back wins at Flemington on Saturday with a dominant win in the Country Achiever Quinton Scott Handicap over 1400m with Lachlan King in the saddle again. Barthelona had the race won early in the straight and went on to score by 4-1/2 lengths without being put under any pressure. With Mike Moroney in England, Racing Manager Anthony Feroce welcomed Barthelona back to the winners’ stall. “I thought it was a breathtaking win - he ran quicker time than the open 1400m, so the quality was there as well,” Feroce said. King said the win was a repeat of Barthelona’s previous start. “It was like last start when I rode him - the horse told me what he wanted to do and rolled along,” King said. Potemkin defied top weight to win Sunday’s Benchmark 64 Handicap over 1600m at Geelong under Stephen Brown. Potemkin had run well at his previous start at Sandown and a quick start was vital. “Stephen was able to get across easily from the wide gate and sit outside the leader,” Feroce said. “The leader gave up early in the straight which left Potemkin in front a long way from home but he was never in danger.